In the modern online marketplace, the importance of advertising cannot be understated. Local businesses, when venturing into the online world, are often in dire need of brand awareness, visibility and thorough advertising plans that generate new customers. This is where Yodle steps in. Yodle is the fastest growing local online advertising company in the U.S. Yodle caters to the needs of local businesses, providing online advertising that is both convenient and cost effective. With a large percentage of consumers flocking to the internet to find local businesses, having an online advertising campaign has become a necessity. Yodle handles the high complexity of running such a campaign, turning advertising into an investment that can be measured by allowing business owners to see exactly how their ads are performing. Kane Albarron, the Senior Interaction Designer at Yodle, chose Brightcove for our clean, valid code, in-depth analytics, and easy to navigate studio. Kane, already an Omniture user, was impressed with Brightcove’s plug and play option that allows for easy integration with the Omniture Analytics Suite. “It was nice to have a plug and play option that would keep track of which videos our visitors like best and helps us improve our future videos to accommodate our visitors’ interests,” says Kane. With the ever increasing volume of customers Yodle is serving, the feature most attractive to Kane was the Brightcove interface itself. “It’s intuitive, fast, and helps get things done easily,” he explains. Our multi-rendition encoding was also a key feature for Yodle, ensuring that site visitors have a great video experience regardless of the strength of their internet connections. Yodle also does a great job of using Brightcove effectively on their site. There’s a very visible Brightcove player on their homepage to capture site visitors’ attention right away. Yodle also has a collection of customer testimonials that tell a great story about the value that Yodle brings to the table for its client base. Yodle is a champion of local companies, going the extra mile to ensure their success in the ever growing online marketplace. 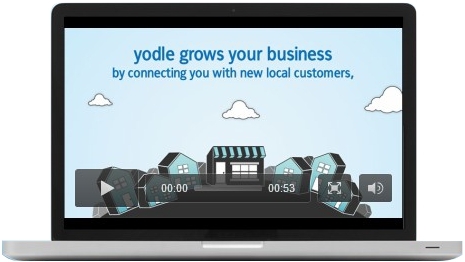 With their Brightcove-powered video experience, Yodle has become a great example of the power of online video for small and medium businesses. I encourage you to check out their site at http://www.yodle.com.